You may also initiate a live chat with support by referring to this article. 2. Once signed into your account, click the “Tickets” button on the left side of the screen. 3. Select the account which requires support and click “Open a New Support Ticket”. 4. 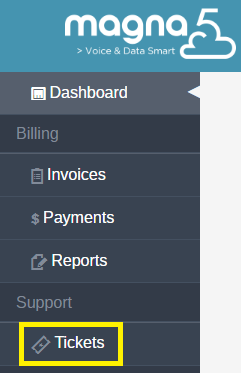 Populate the fields of the ticket with the necessary information then click “Submit Support ticket”. To view the status of a ticket, or to request an update please view the following procedure. If you require immediate assistance you can reach us at 1-(844)-4MAGNA5 x1.